Yujean Kang of Tangram Audio, the U.S. Importer of Audio Tekne of Japan, was particularly proud of being the U.S. representative of the Japanese company. It was not because he thought the products would sell like pancakes; on the contrary, his pride of representation stemmed from the fact that not everyone who could afford it could become an owner, regardless of his financial might. Lest I get myself into catastrophic trouble with our readers, I better explain next. Audio equipment is civilization and music is culture. Don’t sell audio equipment; a seller needs to wait for the customer who understands the value of audio equipment and buys it. 1. The audio equipment for listening to music are not goods sold according to persuasion and power. 2. In short, audio equipment are the goods which are bought after a customer understands the value. 3. Supposing audio equipments are sold at persuasion and power, since the customer bought it without understanding the value, he will get bored with using them immediately. 4. A seller needs to enlighten a customer so that a customer can judge the right sound. For that reason, a seller needs to recommend a customer to go to a concert. However, a seller must not force about it to a customer. 5. A seller has to introduce the good software for his customer, and a seller has to make it a matter of pride for his customer to have much software. 6. A seller does not recommend a customer on a change of audio equipments; only when there is dissatisfaction as opposed to sound quality in a customer, it is right for a seller to teach a customer the cause. “As you may see, Mr. Imai is truly an artist rather than an audio manufacturer. It’s the same in Japan, when someone wishes to buy an Audio Tekne, Mr. Imai will invite the potential buyer to his home and listen at least for a whole day. Then he will gradually make this potential buyer to have a complete understanding about Audio Tekne by listening from a long session. Once you listening to their complete system, whether on the lower model like TFM-2000 or the top-of-the-line such as TFA-9501/TM-9502, you will gain a very strong understanding about what natural sound is. During my last trip in Japan 07, from visiting Audio Tekne, and the day after I left Audio Tekne in Hachioji and traveled to Machida and visited another audio manufacturer, I couldn’t stay for another moment in that manufacturer’s room. Everything sounds bad after you left Audio Tekne’s room. Everything becomes a normal HiFi compare with Audio Tekne. Here I am not trying to be like you as a critic, I am only just wanting to share something with you about Audio Tekne. You may see from this simple selling rules sent by Mr. Imai to me, which say it all about Mr. Imai’s life beliefs. That’s why I never have any pressure on selling Audio Tekne in quantity because Mr. Imai only believes in quality. Audio Tekne may be very selective about its clientele, but it offers 14 amplification products for those lucky enough to be allowed ownership to select. The flagship preamplifier is the TFA-9501 at $60,000, followed by the TFA-8695 at $28,500. For the phono stage, there are three models: the TEA-9501 monoblock flagship phonostage at $150,000, the TEA-8695 extra large coil phonostage at $45,000 and the TEA-2000 entry-level phonostage at $12,000. For the vinyl diehard and/or super-curious, there is the $52,000 ACP-8801 “Record Player System”, equipped with the $3,000 MC-6310 moving-coil cartridge, an arm and a vacuum pump. Note that the TM-9801 is the upgraded version of TM-9501, the TM-8501 is that of the TM-8801, and the TM-9502 is that of the TM-9402. For CD fans, there are four amplification products to choose from. No, Audio Tekne does not manufacturer CD players, but it does offer the LT-9501 flagship CD line transformer with input selector and volume attenuator at $20,850, the LT-9701 extra large coil CD line transformer with input selector and volume attenuator at $10,500, and the LT-4818 and LT-8310 CD line transformers at $2,750 and $1,450 respectively. Mr. Imai’s house and it was the most involving musical experience to him. The company also manufacturers a whole range of cables and accessories too numerous to list here. The subject of this review is the $28,500 TFM-9412, being auditioned in the company of the Feastrex Makoto loudspeaker system. The TFM-9412 was equipped with a Japanese 2-prong plug and cannot be fitted into my AC outlets, the $3,000 ALT-8905 AC line transformer was hence supplied so that I could use any power cable of my choice. Isoclean’s Super Focus was employed. Digital front-end was the 47 Lab PiTracer CD transport and the Audio Note DAC5 Special; the former powered by two Harmonix Reimyo Studio Master power cables, and the latter by Furutech’s latest Piezo Powerflux power cable. Feastrex’s recently-reviewed $69,500 Makoto field-coil single-driver loudspeaker served as the primary reference, with Andy Payor’s $35,000 Rockport Technologies Mira Grand II loudspeaker system providing additional insights. The Wireworld Platinum Eclipse Reference interconnects and speaker cables were the primary cable references, having been used for the most extended period for the review. Enclosed with the review sample was a portfolio of Owner’s Manual, complete with charts and diagrams on the performance parameters specific to the unit. Mr. Imai’s confidence in his product is thus most illustriously illustrated. The Audio Tekne differs from all other manufacturers in the rampant and arguably obsessive use of six super-permalloy transformers in all stages of amplification to achieve lowest signal loss. In a push-pull topology, a quartet of 300Bs produces the output, while two 6463 and two 5687 serve as driver tubes, and two 5Z3 are assigned as rectifier tubes. Neatly grouped onto the right of the amplifier are the three EI-66-35 PCS transformers for the 6463s and 5687s that are inserted in between and visible from a bird’s view, followed immediately on the left by the EI-76-70 PCS output transformer. The last two transformers to the left of the top chassis performed duties the specifics of which I have not been privy to. From left to right, the front plate provides access to POWER ON/OFF, SELECTOR of 5 line inputs, REC OUT, and volume control. According to Yujean, Mr. Imai believes vacuum tube amplification as the only viable choice, and considers the zero-feedback design in a push-pull topology mandatory in creating the “original sound”, a reference to the sound of the recorded instruments. He considers the single-ended topology impractical and unfaithful to the original sound. The TFM-9412 only supports 8 watts per channel, an output level more than adequate for the designer’s own high-efficiency loudspeakers but hardly more practical at least on paper to the $24,000, 7 watts Harmonix Reimyo PAT-777 in driving medium-efficiency speakers, and much less practical than the $29,000-per-pair Svetlana SV-572-10-based Red Rock Audio Renaissance’s 50 watts. Still, it was able to energize the 90 dB/4 Ω Rockport into laying down a foundation for either the jazz double bass in the First Impression Music’s This Is K2 HD Sound! CD, in a track named “Star Dust”. No, there wasn’t the mind-bending, subterranean drumming of the taikos from the JVC XRCD2 Dotou Banri that the Pass Labs could induce through the same speaker, nor was there any hint of sub-30Hz in-room response of the double bass in “Star Dust”. Yet, the sweeping and punctual portrayal of the double bass was evident from the TFM-9412’s meager 8 watts, resplendent with some of the most expeditious and most well-defined bass lines of jazz music that ever came out of the Rockport. It was quite a revelation to hear the two 10-inch ultra stiff paper woofers per speaker recreating the complexity of the large upright instrument with all but the 8 watts of the push-pull 300Bs, despite the fact that both of the woofers were ported. Still, there was control of the two woofers simply not privy to any 8-watt single-ended amplifiers sporting a single 300B. Perhaps the Audio Tekne’s implementation of zero-feedback/push-pull did have merit of sorts that I never experienced, a topology that so many others have tried and met with mixed results; and now a completely different, and perhaps even an triumphant one in the TFM-9412. If eight watts of the Audio Tekne could generate such impressive and refined sound from the Rockport, imagine the kind of sound the company’s TM-8801, a pair of 300B monoblock amplifiers at $40k the pair might attain. The Rockport Mira Grand II specifies 50 watts of amplifier power as minimum, and the Audio Tekne was clearly not in its best element when driving it; the 100 dB Feastrex, on the other hand, ought to be a more perfect companion, and it was. Having only one 6.5-inch field-coil driver, the Feastrex Makoto was naturally limited in the fortitude and magnitude of lower-octave performance, but many high-efficiency speaker enthusiasts made their choice, determined and steadfast, not because they are simply curious, having wandered in the mainstream loudspeaker category for years, satisfied with their low-efficiency speakers and high-power solid-state amplifications and have nothing better to do but to tackle the single-driver speaker. No. We choose high-efficiency single-driver speakers for the spectral coherence and contrasting dynamics such design often have in abundance, and the fact that the low-output single-ended tube amplifiers dismissed by the mainstream audiophiles makes for a magical match with the speakers yields additional, enormous rewards. 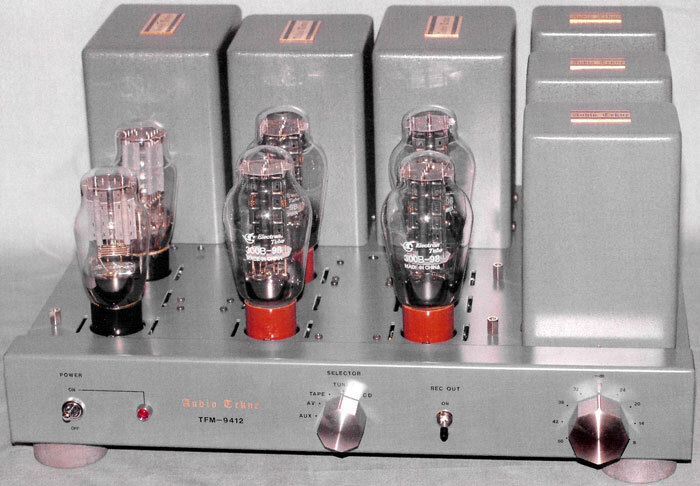 Neither single-ended nor parallel, the TFM-9412 was an oddball in featuring none other but the 300B tubes, and the flamboyancy of its sound was considerable. The female vocal in the K2 HD sampler’s “Kinderpiele”, for example, was sweet and airy, airy most assuredly because of the Feastrex’s powerful field-coil magnet, the same result obtainable also via solid-state amplifications that I have experienced. The sweetness, on the other hand, a very pleasant sonic signature that was also incredibly lucid, belonged completely to the Audio Tekne methodology. True, this was the first time I found myself suspiciously immersed in a golden tone purveyed by a design outside of the directly-heated single-ended triode realm. Nonetheless, the TFM-9412 also was endowed with more super-permalloy transformers than any DHSET amplifier to date, with four 300Bs to boot, too. I’ll admit that I am fairly spoiled by the exceptional products I’ve been given to review, and the TFM-9412 reinforced that. In a big way, the amplifier also revolutionized my established perception of the encompassing superiority of DHSETs. Because whereas most manufacturers utilize one 300B to produce a scant 9 watts, some even as low as 7 watts, the doubling of the tube usually yields twice the power. Yet, Mr. Imai did not intend the TFM-9412 to be another 16-watter for having two 300Bs per channel. Consequently, its spectral extension and integrity, particularly in the sustenance of the most complex orchestral passages, conveyed a fullness and speed not found in other 300B designs and a sonic impression quite exotic to behold. The only quirkiness in the scheme of all things TFM-9412 was the rather large steps of the volume control, which I hope Mr. Imai would consider dividing further. Now, in the scheme of all things Dagogo, there is the monaural version of the integrated dubbed the TM-8801, with twice the output and costs $40,000 the pair. I must confess that I find the TM-8801, equipped with an even larger super-permalloy transformer that will supposedly push the performance envelope of the exotic-sounding integrated to even newer heights, most intriguing and irresistible, especially when the pair can be had for $40,000. If you are into 300Bs, you know what I am getting at. I have got to audition these transformers-laden beauties!